Where we consider art supplies for the cocktail cabinet. How different is your cocktail with high-end liquids, and are premium supplies always the best choice? Martinis and Manhattans remain our staple drinks at cocktail time here at Grade “A” Fancy world headquarters. The frillier potions get their due, but we return to these two time-honored classics most often, and why not have a five o'clock date that’s delicious and dependable? 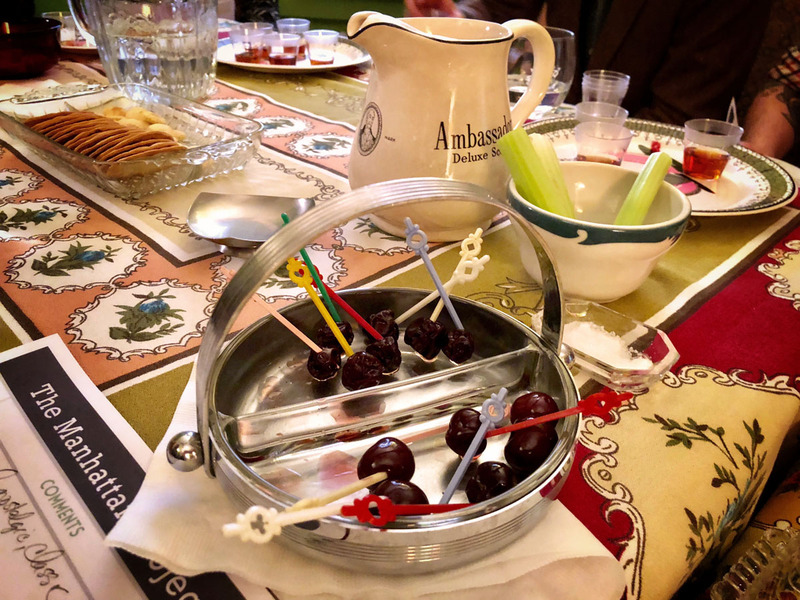 We do tinker with them on occasion, adjusting proportions, adding a squirt of various bitters or boozes, switching garnishes as our mood and brand of spirits will dictate. But we have never had a scientific side-by-side showdown of vermouths. Since freshness is key and we rarely open more than one bottle at a time, what we would need to accomplish this was somebody else’s vermouth. 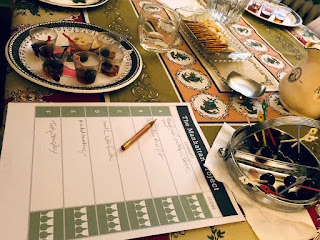 To this end, we convened a blue-ribbon committee of cocktail crazy chums for a blind tasting of Manhattans. Vicky you already know from Codename: Cocktail and her tasty blog Liquorsnapper. At MidCenturyMixology, Chris and Elizabeth are wading through an inherited Old Mr. Boston page by page. Garth’s analytical skill and Shane and Friederike for an artistic angle rounded out the panel. 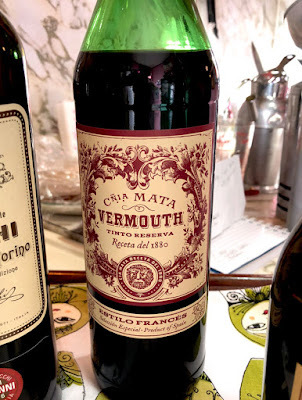 A good liquor store today will have a dazzling number of red vermouths. It was tough but we narrowed our selections to a manageable six, refraining from any new world styles. 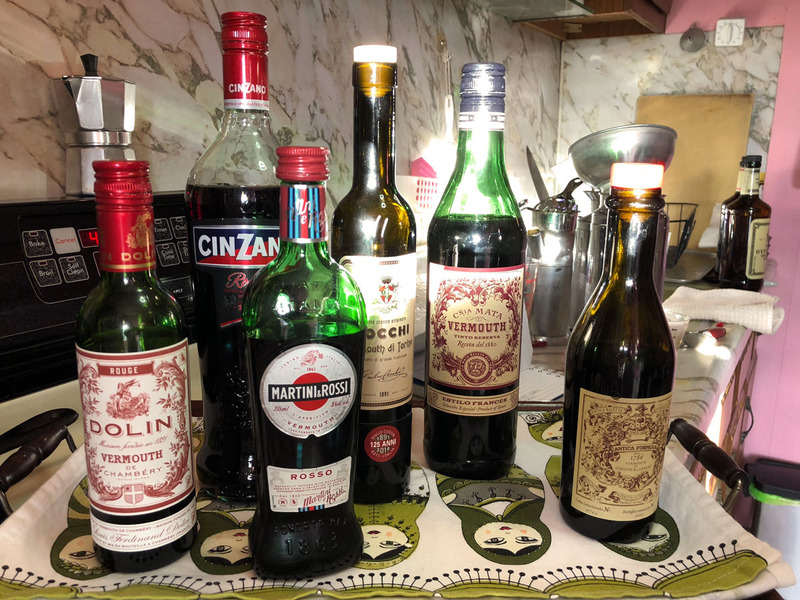 Guests were to bring a few widely available bottles: Cinzano Rosso (Italy), Carpano Antica (Italy), Cocci Vermouth di Torino (Italy), and Dolin Vermouth de Chambéry Rouge (France). We know all the best people, so a bottle of Compañia Vermouth Mata Tinto (Spain)* was proffered by Friederike, whose elegant label design heralded its (re)appearance in the American market. We plotted to sneak in something bottom shelf, Tribuno or Stock, say, or better yet, an oddball bottle, something that you might see in the well at an iffy bar and swear it was a movie prop. Two stores and no luck. We ran out of time, so our fallback was that standard check-out shelf item, the not-at-all-disreputable half bottle of Martini & Rossi. For the rye: This confront was all about the vermouth so the whiskey would need to be good, but not a flavor bomb. Old Overholt was once our old faithful; we were mighty happy with it through the scarce rye years until, about five years back, we noticed that our Manhattans were tasting a bit syrupy and flaccid. Vermouth being the sweet element of the drink, we immediately placed the blame and swapped brands, without solid success. So, was it us? Had we become…hard-boiled? Upping the hard stuff made our cocktails stronger, but not better. Yep, this was driving us crazy. At which point we learned that the Overholt overlords were selling us 3 year aged bottles instead of the 4 year. Big aha. We moved to other brands as they became available. All this made us excited about the recently available Old​ Overholt Bonded Straight Rye – a little too excited because when​ we spotted it while shopping for this project it somehow ​leapt into our cart. At 100 proof, the thought occurred that the tasting might lose focus, so we bought a bottle of the regular Overholt, too, and decided to use them mixed 50-50. 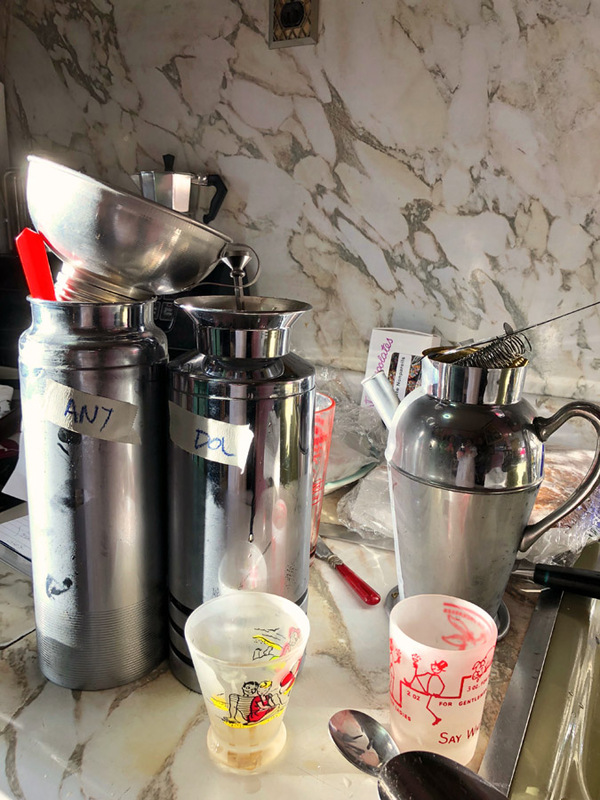 With our taster panel settled in, Vicky and Karen mixed the individual broths over ice in chrome vessels, bottled the results, and popped them in the refrigerator. When all six samples were concocted, we served in glasses marked A through F.
Here’s some of what the panel had to say. 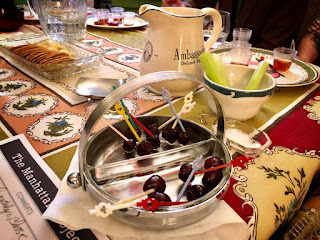 Some tasters thought the Cocci Manhattan had a nice balance, but others found it flat, no depth, and the least favorite. The color also was lighter and not as attractive coupled with the rye. The Cinzano was described as winey, herbal, rich, deep and spicy. Others thought it sour and lacking depth. Martini & Rossi was found to be spicy, an easy drinker, and #1; two samplers thought it was the driest. One wag said it was “pretty OK.” Mata got raves — it was complex, unusual, had a cola aspect, was thick, rich, worked well with the rye, a fave and a standout. One taster found it cloying and banal. The Carpano Antica was judged the “sweetest, therefore reminiscent of a lot of poor Manhattans, but could be great in the right hands.” Others found it warm, interesting, boring, and two said it was their least favorite. And finally the Dolin was unremarkable, meh, nothing outstanding, and OK. On the other hand, some tasters noted its mineral, spicy, apples, pears and quinine aspects and thought it mixed well. We agreed it might be nice with a sweeter liquor, like bourbon. 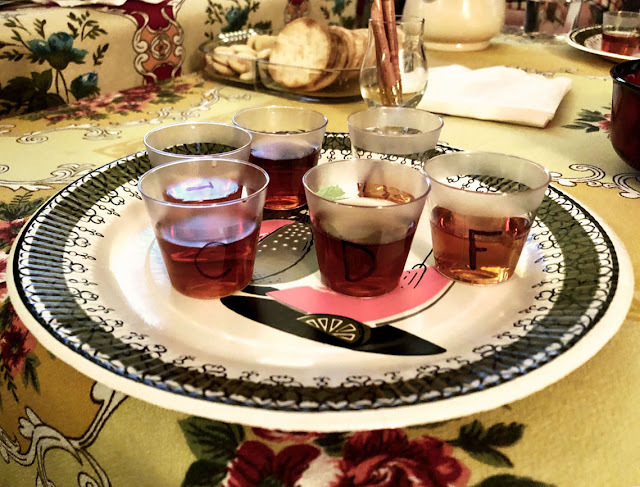 In conclusion: match your favorite vermouth to your favorite rye. Drink up. But don’t high hat the popular mid-price brands just because they are familiar. They may turn out to be the perfect mixer. Friederike Paetzold, Garth Powell, and Vicky Sweat. With special appearances by Chris Karwowski and Jinx Louise. *Yes, Compañia Mata Tinto is available in this country. In NYC, at Despaña and Vintry Wines, for example.